Do you know what year this map is from? It says 1966 up there? Not exactly sure. 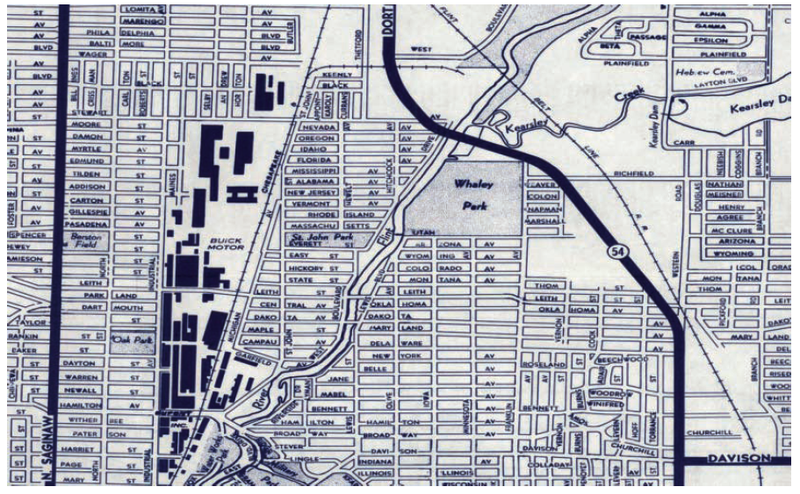 The urban renewal project that cleared the land for I-475, the expansion of Buick, and an industrial park was announced in 1960, the same year as the last revised master plan for the city. The work took place in the sixties and early seventies and cost approximately $130 million. So this map must be pre 1960 at least. I've been reading about this fiasco, which failed to provide the promised desegregated housing for black residents of the neighborhood or bring jobs to Flint. My mom told me she saw Miles Davis perform at a blind pig in the St. John neighborhood in the 1940s. She also used to shop at a place called Cal's Record Mart there. 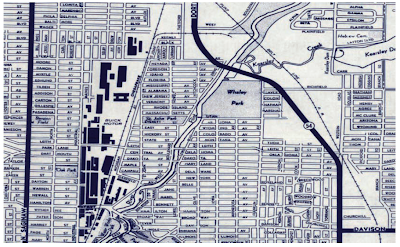 Also, it shows that the Dakota Street bridge at Lewis Street is still open in this map. Any Flint historians know when that bridge was closed to thru traffic? Based on the modern curvilinear streets in the subdivision in the NE corner of the map, I'd say it was the late 1950s at the earliest. That urban renewal fiasco was played out in many cities. Those high rises in Chicago have all been torn down, so even if the housing had been built, that doesn't mean it would have been successful. Just tracked down that this is a 1966 map from AAA. While Flint is not alone in its failed "urban removal" project, the city was particularly duplicitous in its dealings with St. John residents. The city dragged its heels on funding the project because it was unwilling to cough up the money to properly help residents relocate. Meanwhile, the city banned building permits so the neighborhood declined further. Then the city low-balled homeowners on the value of their residences, making it difficult for them to buy elsewhere. Finally, the city ignored demands for access to integrated housing, building new rental and subsidized housing in predominantly African-American neighborhoods and fringe sites that became instantly segregated housing. All in all a sorry time in Flint history. Hard to nail the year, but your probably right Gordie. I was trying to date it from the factory buildings at Buick. But whom ever did this map has 1920 buildings mixed in with 1953 buildings so that was no help. I grew up there in the 70's and 80"s at Franklin and Maryland. I can say it was pretty hard to live there at times. So, many neighborhood businesses left at that time. My mom tried to get into a special government loan/grant thing to fix up the house and it was so bloody difficult to deal with she said to hell with it. Others on our street tried as well but they too decided not to deal with it. The St. John Industrial Park unfortunately became the Flint model for renewal practices. I worked on it in '76 and '77 -- one of three local design firms involved. (Three that I know of, at least.) All three had their billing meters fastidiously recording the time spent on the project. I took a hiatus of seven years to try and launch my own private practice and upon return in '84, I was again working on finalizing the plat maps for St. John. To my knowledge, seventeen years later the plat has still not been recorded and the parcels are sold and marketed as unplatted tracts. ...which brings us to Smith Village. I worked on it in '00 and '01. It too has still not been completed though those billing meters continue to churn away. I guess I don't really have a point to make here. Just sayin' -- Flint's decline notwithstanding, a lot of local businesses made money on these two grand ventures and a lot of city employees continued to earn paychecks for the duration of both. Thanks for posting this, Gordie. As long as I can remember (37 years), I475 has always been around but I've always been curious about the St. John's neighborhood. I lived in Flint for over 20 years fulltime and strangely enough, I rarely went into the Buick area. I was a "Chevy In The Hole" kid, much as I dislike this name for Chevrolet Flint Manufacturing, the birthplace of General Motors, at least the original General Motors. This map has brought back memories that I did have of the area. Some of my family members used to go to Dr. Finkelstein on Broadway near Lewis. I see that the original Sippin' Lizzard was just two blocks from there. Someone once wanted to sell me a business in that area. It's a good thing I didn't buy it, but it was pretty bad even then. I think Highsmith may have overlooked the obvious. Probably a lot of the houses in the St. John's area which, though older and blighted, were owned by the African Americans who lived there. 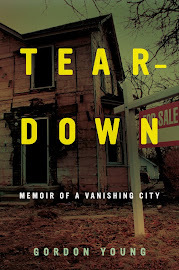 By tearing down the neighborhood, and not paying a decent market value for the housing, government at all levels destroyed a relatively stable area and replaced it with government subsidized housing which quickly deteriorated. It created a government dependency which continues and increases today, with disastrous results. The same thing is happening now with all the arson in Flint and Detroit, once again forcing many the occupants into government owned and subsidized housing. One should view all this with suspicion after once again failing miserably to live up to the "infinite wisdom" of government which some continue to promote. Anonymous, you should go to the link and read Highsmith's dissertation. He didn't overlook the obvious. In fact, you echo some of the main points of his thesis. "You're enemy won't do you no harm, 'cause you know where he's comin' from"- "Smiling Faces Sometimes"-Undisputed Truth. In other words, overt racism is not as big of a problem as misguided dogooder guilt. That was the nationwide motivation for "Urban Renewal". Is this what Highsmith is saying? Anonymous, I'm not really comfortable summing up his dissertation, given that he knows far more about the topic than I do. Give it a read. Given your interest in Flint, I think you'd like it. The dissertation is interesting. A little too wonky but what can you expect from the U of M? His thesis is interesting but at time he pushes the facts to conform to his narrative. Having grown up during the GM heyday and having left before the decline I have rather different memories of the period.